One mom who never ceases to amaze and inspire me is design mom. Please read this very exciting interview and be inspired! 1. How did you come up with your blog title? I wish the story were more exciting. :) I'm a graphic designer and a mother, and both of those titles seem to influence each other in my daily life. I make decisions as a mother based on my design training and experience. And the fact that I am a mother affects how and when I can be a design professional, so the title "Design Mom" seemed to make sense. My intention, as I started , was to keep a record of how motherhood looks to me as viewed through a design filter -- or the intersection of Motherhood and Design. start my own, but found that writing personal essays, no matter how short or light, was terribly time-consuming and challenging for me. Plus it totally stressed me out. Then my sister Jordan started her blog, O Happy day. It was (and still is) mostly photos, with a sentence of two underneath. A lightbulb went off in my head -- I could write a couple of sentences without stressing. The timing was perfect, my baby number 5 was 2 months old, and I was looking or a creative outlet that I could do at odd hours -- or in my pajamas. Something that would help me ward off post-partum depression (which by baby number 5, I knew was prone to) and would be less stressful than taking on more freelance design clients. Blogging was the perfect fit. 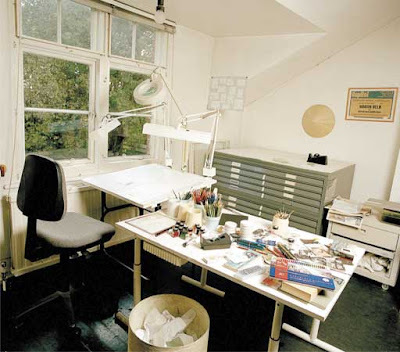 3. Who do you admire the most in the Design World? Oh man, it's always hard to name names. and a million more. . .
4. When will you develop a line of your own? Good Question. I have no idea when but I do know I'd loe to Right now, I'm more interested in collaborating with an exciting line than start from scratch. We'll see what I come up with. It has been so much fun and gives me a daily creative fix. Plus it's led to lots of cool opportunities. For example, without blogging, I would have never started sk*rt and I can hardly imagine my life without sk*rt. give a baby a bath, make a bed, eat a decent meal, get showered and dressed. With a newborn, a list like that is a major accomplishment. As far as affecting my role as a MOM goes, it has for sure affected my daily schedule. As my blog morphs into a business, I have brought in a babysitter a few mornings a week so that I can have some dedicated time to work on Design Mom and sk*rt. And when my kids make something cool, they always ask me if I'm going to blog about it! Well, Design Mom, thanks so much for taking time to answer these questions and for inspiring each of us daily with your blog, while you intersect being a Graphic Designer and a MOM! Do you have Moms in your life that inspire you, love to hear who they are? "Was my desk too late?" Perhaps I will leave you guessing on this desk. I tend to work very much the same way, piles, piles that I know where everything is. I have baskets and shelves and drawers and bins, that I know where everything is too. This desk happens to be located down in the Lone Star State. Can any of you imagine who this desk might belong to? Give it an ole college try, s'il vous plait? I think Mr. Buckley knows exactly where everything is too. 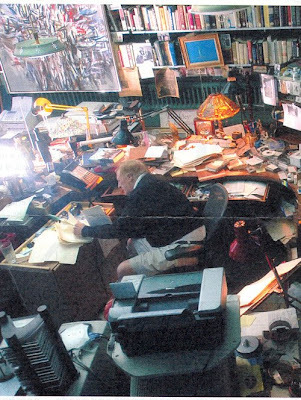 I can only imagine that every little thing salvaged and saved from that office must be worth lots of money. This photo was sent to me by a lady with a great eye for design, as well as smarts. I like a man who is confident enough to work in bermuda shorts. 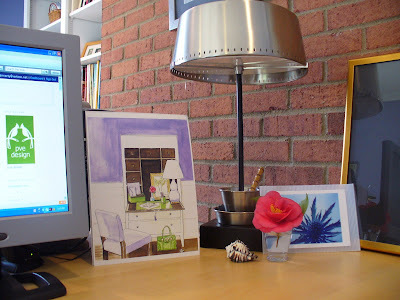 The weekend has arrived and I am wrapping up this series of desk vignette posts. What I have gleamed from these posts is that we all are unique, and each and every one of us has our own voice, our own style and certainly our own way or working. Some of us envision our own studio while we work from perhaps a temporary spot. However, each of us arrive to work, pajamas, or fully dressed, we all know what makes us tick. Piles are necessary for some while others strive to have an uncluttered desk. Perfection is often found in imperfection. I was unable to upload one of the best shots, one sent to me from the home office bed. I shall try again later. Seldom, do I feel alone as an artist or a blogger, I find like-minded individuals all working to create, to inspire as well as carve out a niche for a little time to work while in the midst of mothering and home making. I might add, all making it simple easy and elegant. Making new friends along the way has been such a pleasant and sweet contribution to my day. My circle has grown and I feel so much support from each of you. Thank you for sharing your spaces. of cheer and the artwork done by her very own little masters is hung to add whimsy and to keep it simply inspiring. Please welcome Seleta. 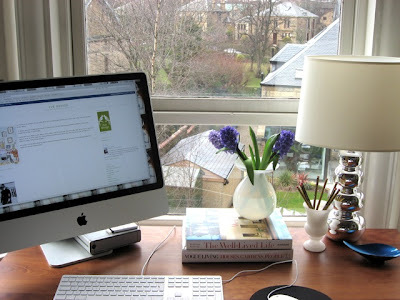 Part of my impetus to post a series of desk vignettes and office spaces was purely to peek inside your space as well as give a dear friend some motivation to help her rally to find a niche for her writing. Kwana writes! After all, what are best friends for. 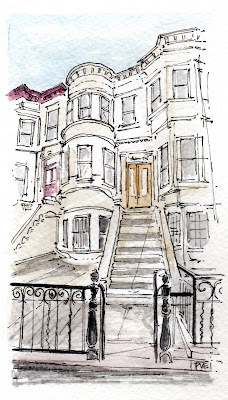 I think if my memory serves me, I may have even told her to buy the house she is in rather than the one on that busy street, (this one is also walking distance from my home.) Selfish interests at heart. But it is all about the location. Given the price of gas, it would also have required me to drive, but now I can walk. 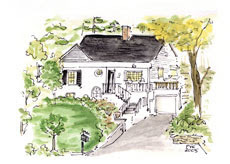 As a house-warming gift, I illustrated her charming home which she used as her moving announcement. I like drawing and painting for friends, they always love my work or at least they tell me they do. works from this space designing with ease and always a sense of humor. Note the dog toys scattered about. Really love that giant board to post bits and pieces or swatches, paint chips, tear sheets or photos! 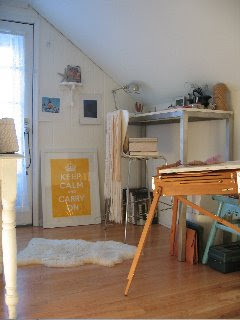 Marichelle of Lifeflix sent this snap shot of her craft corner. 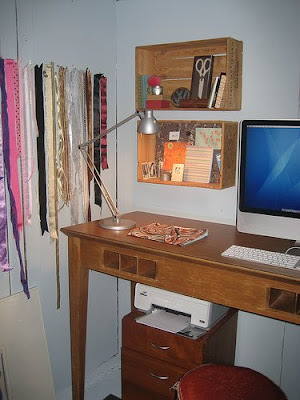 Are you feeling inspired to get your craft corner ready for some serious crafting. 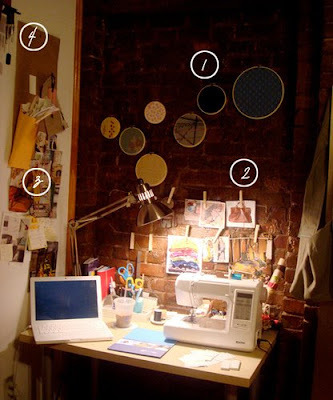 I love the simple string, the clothespins and the embroidery hoops hanging on the wall! 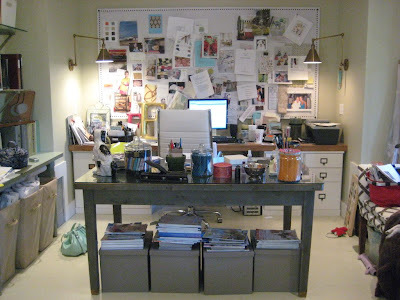 Every Mom needs a little desk, a little corner or perhaps even a garage turned into a spot where she can suddenly become design mom. Make time for the design mother or father in you. 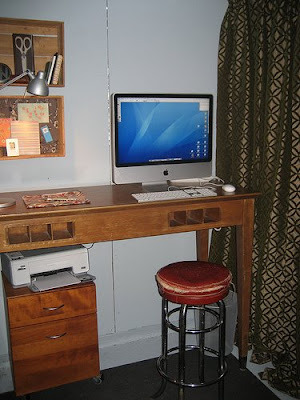 Design mom never ceases to inspire me while she is the mother of 5 and posts really cool things that make me want them. 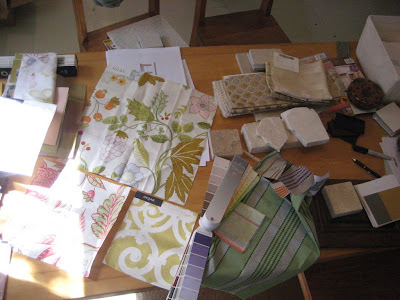 Next week I shall be posting a great profile, interview with design mom! How cool is that? 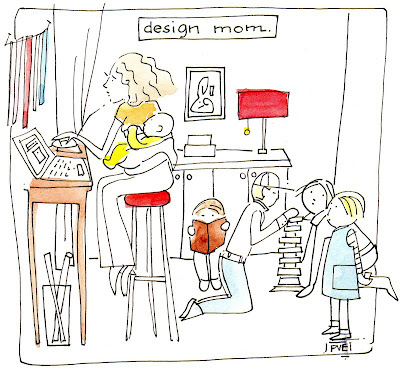 I know that you will want to embrace your inner design mom lurking inside. Make a spot for you to create an artful life in the midst of parenting. Inspire your family. Who knows you might even be able to make a living at it. These touches are nice to come home to. He also uses a Mont Blanc pen. 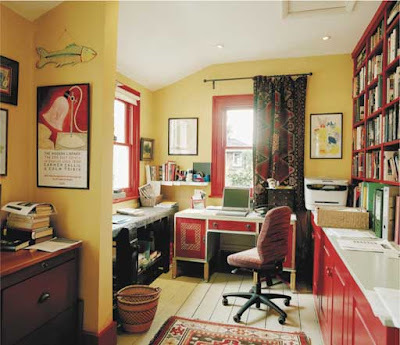 Carmen Callil writes from this sunny yellow and red office. Her works are serious, one can only imagine that you would need a cheery spot to keep the faith of writing the book, "Bad Faith." 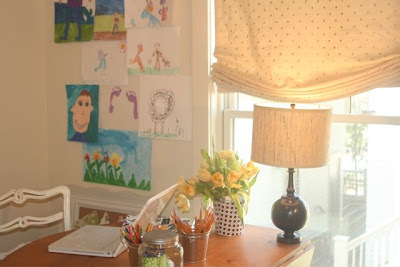 Love the rug come curtain used as a drape, the painted floor and the shelves for books, binders and files. I myself love these rooms, they have a lived in, not too sterile quality. You can just tell that words and thoughts abound. They have soul. 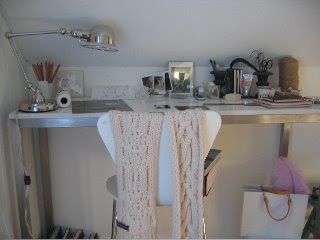 One musette sent me photos of her desk vignette today. A sparkly silvery spot to work. I want to paint the walls a robins egg blue or a sunny egg yolk yellow. My sister sent me a photo of her desk which I was excited to post. She has one of my paintings as her screen saver. She has a lovely view overlooking the woods. It has a grown-up tree house feel to it. 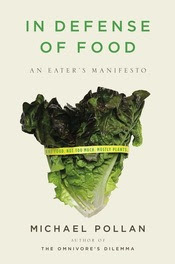 In all fairness,"In defense of food", I would need nourishment to provide energy. Room service please. I could see a picnic basket full of healthy and fresh finds. Art requires one to work, to produce, to make a mess if you will. It is after all a messy business. From chaos comes order and creativity. 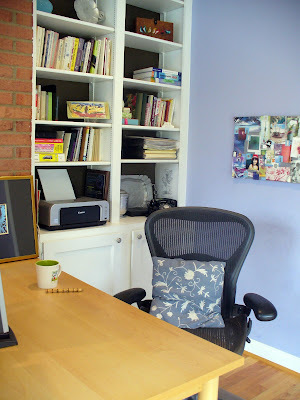 Light, and storage is required, a good seat as well as art supplies. I like this spot - where Judith Kerr works, perched next to a window, trash bin next to her even though she admits that most things land on the floor. It is an honest space, good for making art. and she refers to this as her "art mess" - well now I think you must have attached the wrong photo, because this looks clean, tidy and a sweet corner to paint all you do! We have become art comrades and united via blogging. One of these days we will meet in person and share some paint plein air along with a side of "Salade Nicoise", extra annechovie please and perhaps some Rose wine. We both love pink and we could talk for days. 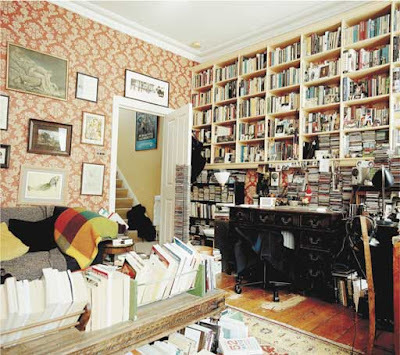 Esther Freud, writer and daughter of Lucian Freud writes from this spot where one can only imagine the slow unfolding of words turning into a novel. Note the shoes are ready for immediate departure. The cardboard box must surely contain something very important. This is the desk from "All the best" which I was very honored to receive today. Just take a look at the lovely spot in Scotland and the pretty view out the window. It's so nice to put the desk with the blogger. Perfectly appointed with a stunning silver lamp, and fresh hyacinths, don't they smell divine. I illustrated the blog header for All the Best, so I feel like I have visited a wonderful friend, one with a well- lived desk. 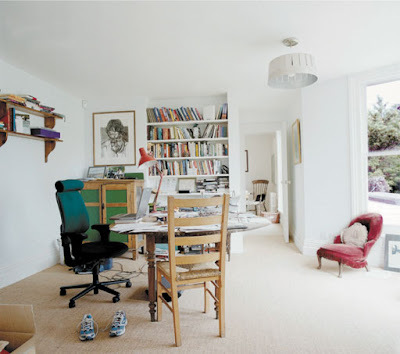 The desk from "My Notting Hill" - Look at her lovely organized shelves and comfortable Aeron Chair. 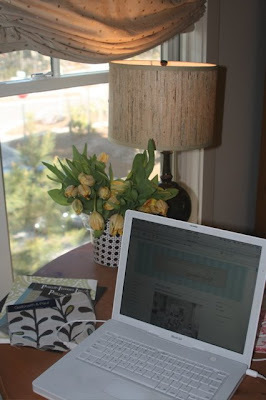 I love to see where everyone works to fulfill their dreams, blogging while designing a wonderful life. Quite a lovely shade of blue hydrangea, very soothing and calm and the back of the shelves are a dark chocolate. The combination is rich and inviting, yin and yang. Good feng shui to have your back to the wall. I feel really great "chi"energy from this spot! 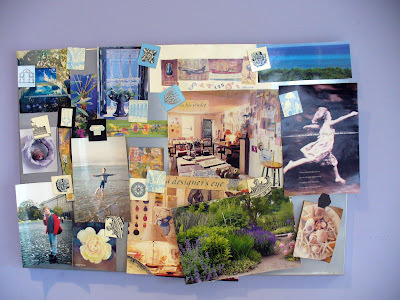 Inspiration Boards are beautiful for posting a collection to show your true hopes and dreams. 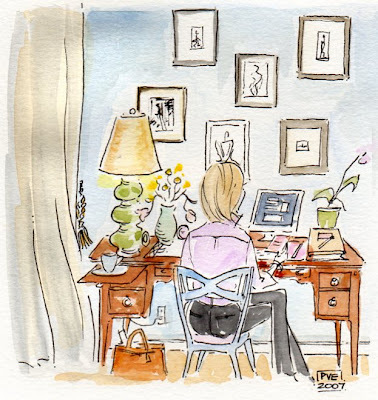 Please feel free to e-mail a photo or sketch of your desk, and keep in mind it is not perfection we are after, rather a glimpse into your creative spot, piles and all. Thanks to each of you for allowing us to view your desk vignette. Un bureau is the linchpin of your home office. It is a place to plan projects, give birth to new ideas , and run your day to day affairs. Un bureau provides a spot to open letters or open e-mail, pay bills and invoices, answer invitations, review mail, magazines and the countless piles. 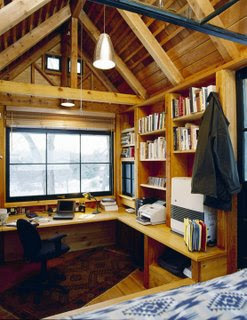 Please send me a photo of your desk or home office. I would love to see what is on your desk. 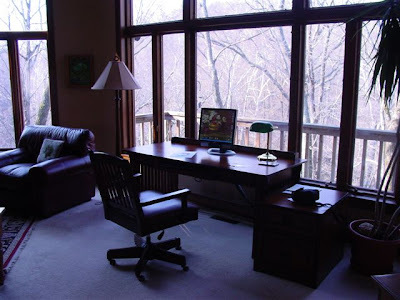 Do you have a desk and space to work on tasks? 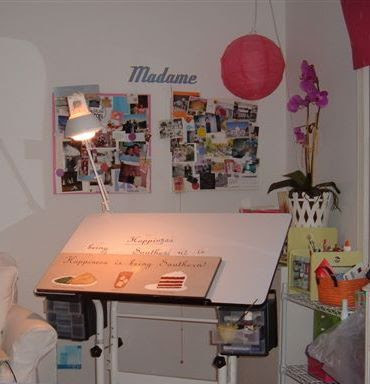 Does your space provide a creative spot, and do you feel inspired to write, to draw, or to make the latest crafty artistic project. This week, I will be dedicating my blog to taking a challenge and setting up my desk, to tame the paper piles and soothe the savage creative beast. 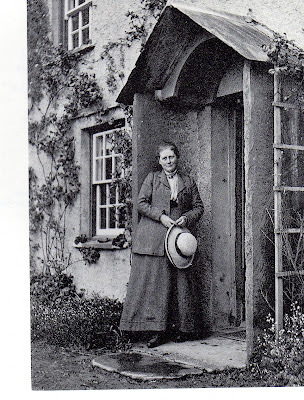 One of my most favorite illustrators is Beatrix Potter. Look at what a classic woman with so many stories and tales to tell literally surrounding her. 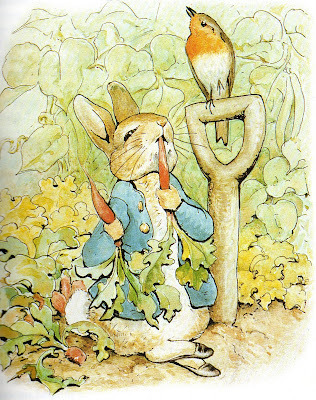 Many of you must know her infamous career began when "The Tale of Peter Rabbit" was published in 1902. Prior to being published and loved by by the public, it had been rejected by several firms. Beatrix was full of ideas, stories and illustrations. 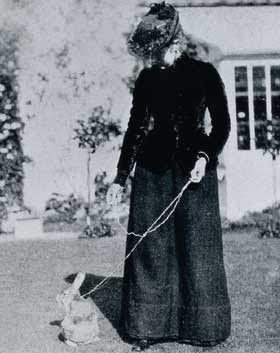 with a vision and strength which led her to find creative fulfillment. This artful rabbit wishes you a Happy Spring and a Happy Easter. I always admired his blue coat with brass buttons. I will share my needlepoint that I did of this illustration in tribute to Peter as a gift for my daughter's nursery. There is nothing better than a stack of fresh laundry. Laundry hanging on a line, drying in the summer breeze. This chic "laundress" is about to collect her fresh cottons. Look closely at her assistant in the basket. "Laundress" sounds so much more glamourous than laundry lady. 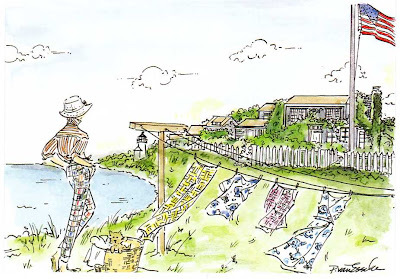 Next time you do the laundry, fancy yourself the "Laundress" - the goddess of clean laundry! 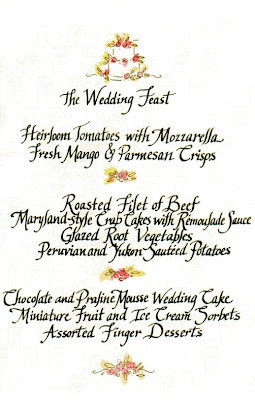 for a Wedding Feast. Guest place cards also accompanied this menu, using the small flowers on each card washed with water-color. The wedding took place in a historic garden and the colors were glorious pale green linen with pale pink flowers. A fancy festive feast! Contact me to add that special touch to any occasion, Place cards, Menus, Guest Books or Albums. 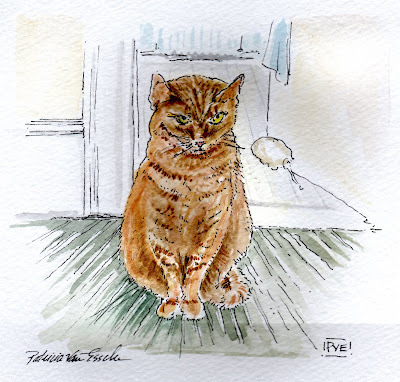 Capturing the soul of a cat or dog in an illustration gives me great reward. hand, I feel as if I know the creature, feel the fur, imagine the bark or purr of the personality. Pets provide a story of joy to our world. 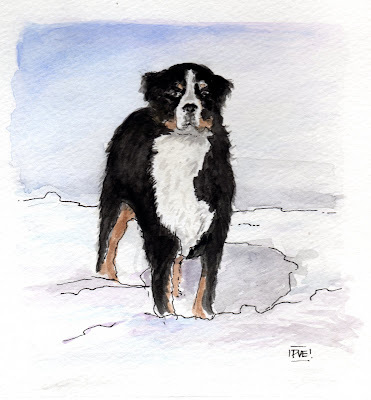 For a commissioned illustration of your pet or a beloved creature, please contact me. My penchant for creating an artful life attracted this graceful photo stylist to me. Apparently, I had inspired her to join the sea of bloggers. Please welcome one musette, Maureen Burns. Maureen began "prep" styling as a way to earn some extra income while she was illustrating and she never looked back. The diversity and pace of photo styling lured her as well as the ability to take everyday items and place them in an extraordinary way. 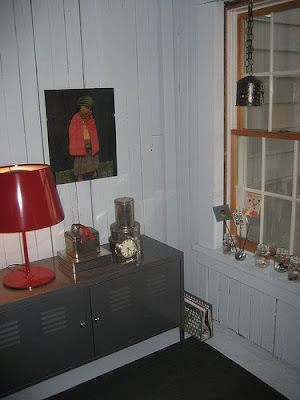 Styling involves looking closely with a fresh perspective. Like Goldilocks, she knows when the items at hand are just right. Finding beauty and setting it in a magical light provides fascination for Maureen as well as the photographer. The black and white photo is Maureen and her boyfriend. He happens to be a photographer which I find amusing. I adore black and white photographs. Look at this photo, the shabby kitchen is a clever backdrop for these gorgeous children. 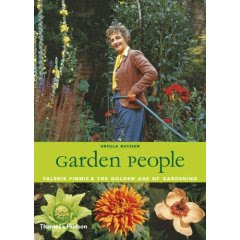 Maureen has a favorite, a book which is "Garden People" - my kinda people. Take a look at the photographs. You will be inspired to pick up your own and add it to your book collection. 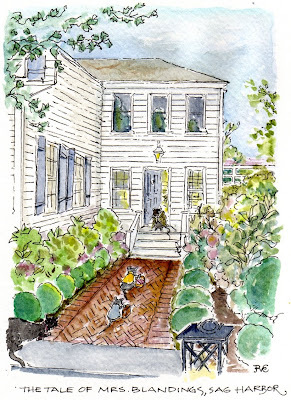 After all, so many of us love books as well as the garden. 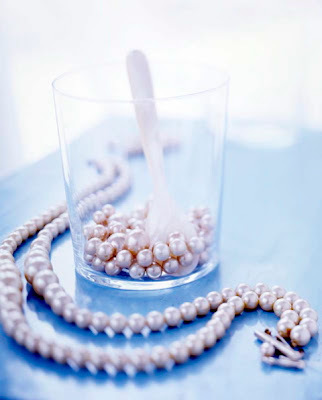 All from a grain of sand, comes one amusing pearl, full of grace. I love the way Maureen styled these beauties. It looks like the perfect potion for me. Please welcome Maureen, she is one Musette to watch. Go ahead and keep us gracefully amused. Oh, and please wish her a Happy St.Patricks day, after she does have a wee bit o Irish in her. Funny, just when you think that your family never reads your blog, one member comes forward and feels left out that she is never "blogged" about! Well, you dear sister, are a dream! My sister just completed a fabric covered head-board which she is sending a photo my way. Her home is lovely. She has exquisite taste and an eye for detail. Pure and utter simplicity is a daily way for her. I admire her patience and fortitude. She handles everything with calm and order. Her annual trip to visit inspires me to bring a sister-zen to my utter mayhem, all in a matter of minutes. Ommm! I never imagined the incredibly creative people that would come into my world via my blog. My mission was to inspire and connect, all the while I create an artful life. My mission is far from accomplished, yet I feel such gratitude to those of you who stop by to pay a visit, to tell me how much you love my work or how I have inspired you. One such individual connected with me and I felt compelled to post about this amusing individual. She was thinking about her own blog. She just joined the blogosphere. Everyone needs one musette. Please welcome musette and I will post more on her in one of my next posts. Many of you know me by my illustrations for this American label. I have illustrated every shop over the years as they have grown from 3 to plus 40. 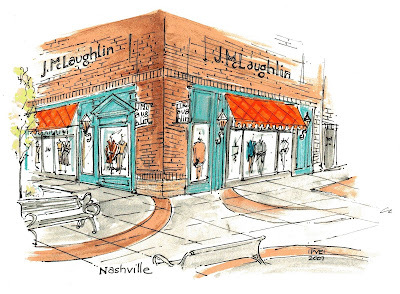 Do you have a favorite shop, boutique or place you window shop? What keeps you faithful, is it the product, the sales clientelle or the windows, that makes you feel like shopping? Is there a shop that calls out to you? I know I have my favorites. Calling on you to tell me your favorite shops! Is there a favorite childhood shop? A special shop memory? A shop you would like me to illustrate? I love a day of window shopping. 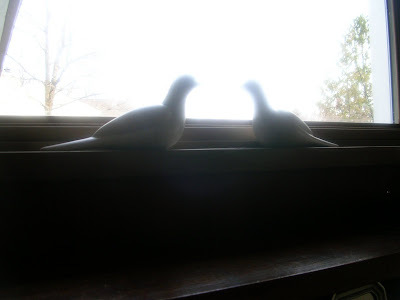 I was inspired to take this photo of my kitchen window by urban grace interiors. I have named it my "window silhouette." 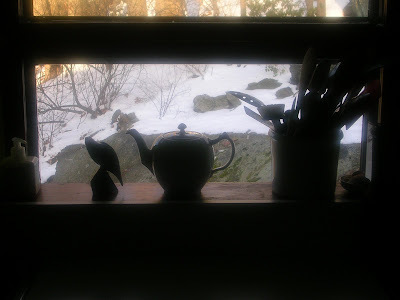 Everyday, as I am in front of this window, washing my hands, preparing the meals, doing the dishes, or making a pot of tea. I am reminded to look outside at the beauty of nature, the changing of the seasons, the dawn of a new day. What does your window silhouette look like? Fashionably late to the party! My own blog party which 5 minutes for Mom started. 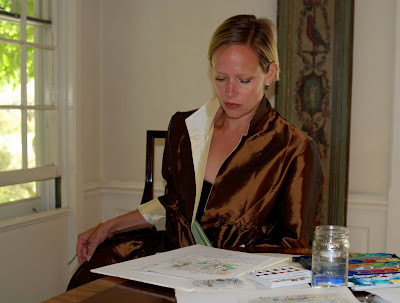 I am an artist, a mother of 3 and blogger with a penchant for creating an artful life. You can visit my site, pve design to see my work. Drop in, even if it is for a minute, happy to have you and hope you are inspired. "Life is short, art long, opportunity fleeting, experience treacherous, judgement difficult." My art-work requires work. I face the paper each day with thoughts, scores of pictures and ideas swirl inside until they take shape. Ingredients lie before me, water, pens, brush, paint, paper but often the recipe for the actual work is not complete until I have done the work. Art requires work and patience, trust, and the ability to capture the thoughts that are allowed to be still. Challenges and obstacles often present the most fear, yet they have produced some of my best work. When I began this on-line journal, I never imagined the experience of hearts that I might be able to touch, to inspire, and to meet. My art tells me that life is short and that I have a long road ahead of me with many incredible experiences. I have committed myself to my work, to my hands and to my art. Thank-you to each of you who have faith in me and my art. Spring is the perfect time to go out for a stroll. 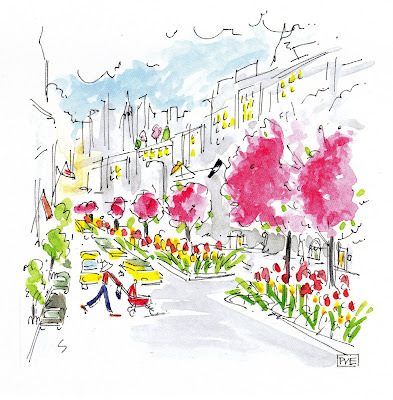 Soon the trees will be in blossom and provide a perfect opportunity to go outside, onto the avenue or to your favorite park. 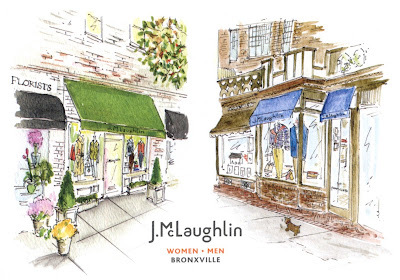 This illustration was commissioned for A.Tierney, a purveyor of preppy accessories for ladies, men, children and infants. Take a minute to put a little spring in your step or sport a little spring accessory! Everyone should be so lucky to have a friend like this, one that will post a portrait of you. 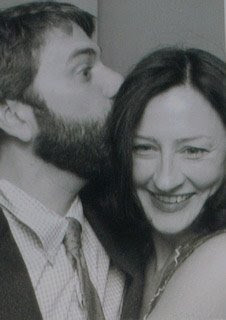 Lucky me - my friend, Kwana writes this lovely post, today. All we need is the morning light to shine to remind us that there is a new day. This light shines down upon this Brooklyn Limestone being lovingly restored and cared for, giving it new life. Several weeks ago the owner inquired about an illustration and having seen her last post, I only thought that this post might shine a bright light to her day.